This is a scalable context timeline. It contains events related to the event Mid-1990s: Multitude of Nationalities Seen at Khan Guest Houses. You can narrow or broaden the context of this timeline by adjusting the zoom level. The lower the scale, the more relevant the items on average will be, while the higher the scale, the less relevant the items, on average, will be. Pakistani Prime Minister Benazir Bhutto visits North Korea after being asked to do so by nuclear scientist A. Q. Khan to help co-operation between the two countries on nuclear weapons and delivery systems (see Shortly Before December 29, 1993 and Shortly Before December 29, 1993). Deal - Bhutto then asks Kim for blueprints for missiles that can deliver Pakistan’s nuclear weapons in a potential strike on India. Kim is surprised, but Bhutto emphasizes that “We need those missiles.” Kim agrees and proposes setting up technical teams, giving her information on computer discs to take home with her the next day. Something More? - However, Bhutto will later remark: “They gave me a bag of materials. Kim said the teams each side selected would do the deal, whatever the deal was to be. I really had little idea of what they were discussing. I did wonder, though. Was it only missiles? They said it was to be a cash deal.” Bhutto will also say that General Khawaja Ziauddin, a close associate of Khan, was in charge of the deal for the Pakistanis. A North Korean delegation visits Pakistan to discuss co-operation between the two countries. The delegation is led by Choe Kwang, vice chairman of North Korea’s National Defense Commission, minister of the people’s armed forces, and marshal of the Korean People’s Army, who is responsible for North Korea’s nuclear procurement program. Kwang Tours Pakistani Nuclear Facilities, Meets Pakistani Officials - General Wahid Kakar, chief of Pakistan’s army, takes Kwang on a tour of Pakistan’s leading nuclear weapons facility, Khan Research Laboratories (KRL), although security there is very strict and foreigners are generally not allowed near it. Kwang also visits a secret missile production facility near Faisalabad and a missile test site near Jhelum, in the northern Punjab. Additionally, Kwang meets Pakistani President Farooq Leghari, Defense Minister Aftab Shaban Mirani, and high-ranking military officials. Hwang Jang-yop, a former aide to President Kim Il-sung, becomes the highest-ranking North Korean official to defect. During debriefings, he tells investigators that Pakistan and North Korea made a deal to trade No-dong missiles for uranium enrichment technology after a delegation from Khan Research Laboratories visited North Korea in the summer of 1996 (see 1996). He claims that the secret enrichment plant is based in a series of caves near the town of Kumch’ang-ni, 100 miles north of Pyongyang, and 30 miles northwest of North Korea’s nuclear reactor at Yongbyon-kun. [Levy and Scott-Clark, 2007, pp. 281] However, inspectors will later visit the location and find no technology there (see 1999). 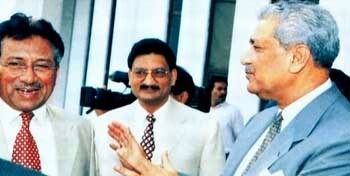 Pakistani President Pervez Musharraf (left) and A. Q. Khan (right). [Source: CBC]Pakistani President Pervez Musharraf denies that there is any nuclear cooperation between Pakistan and North Korea. He says, “There is no such thing as collaboration with North Korea in the nuclear arena.” He also calls allegations made by the New York Times that Pakistan had helped North Korea with its nuclear program and this was known to American intelligence “absolutely baseless.” [New York Times, 10/20/2002; Levy and Scott-Clark, 2007, pp. 339, 525] However, Pakistan, in particular nuclear scientist A. Q. Khan and the military, has been assisting North Korea’s uranium enrichment program for the best part of a decade (see, for example, August 1992, May 1993, Shortly Before December 29, 1993, December 29, 1993 and Shortly After, January 1994, Mid-1990s, November 19-24, 1995, 1996, Summer 1996, 1997, 1997, and November 2002).